IDM Mining is a Resource Opportunities sponsor company. In the summer of 2016 I visited IDM Mining’s Red Mountain high-grade gold project in northwestern British Columbia for the first time, and most of the underground workings were still flooded with water. The conditions were a testament to the project’s mothballed status before IDM took over. To the weather, as well: the mountains outside of Stewart get plenty of precipitation in the form of both rain and snow. Some fell during that mid-summer visit. When I returned recently, most of the water in the two kilometres of underground workings had been pumped out. Our group of analysts and investment bankers was able to hike deep inside the mountain. We crossed the portal and CEO Rob McLeod walked us through a damp, dark world, past several crosscuts accessing mineralized zones as well as sites where the underground drill was turning. The gold grades have to be rich to make a mine economic in such an environment, and Red Mountain ore is. 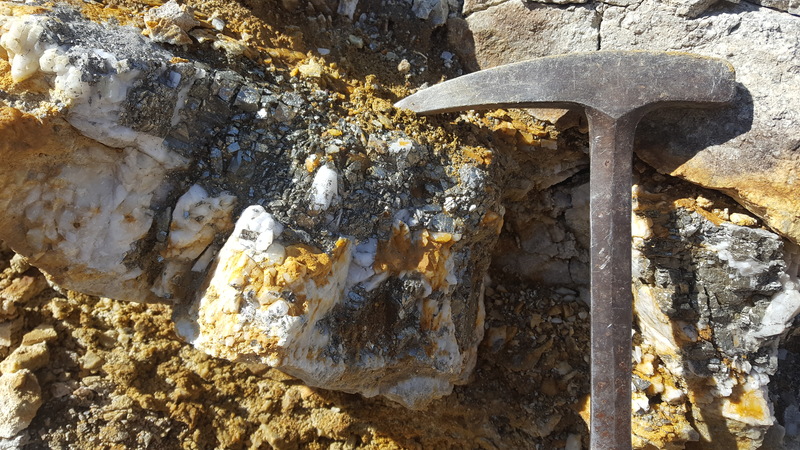 IDM’s latest intercepts, announced Sept. 5, are the highest-grade ever recorded at Red Mountain: 4.9 metres of 149.2 g/t gold and 59 g/t silver in the Marc Zone, the first mineralized area to be mined. The hit included 0.5 metres of 1,400 g/t Au and 437 g/t Ag. Average grades of reserves at Red Mountain are 7.53 g/t Au and 21.86 g/t Ag – multiples of global grades being mined. Majors including Lac Minerals and Royal Oak Mines spent several million dollars blasting out the portal and underground decline before abandoning the project, which IDM CEO Rob McLeod had worked on as a junior geologist. IDM optioned the 17,125-hectare project in 2014 and has systematically advanced it to the permitting stage. A recently published Feasibility Study shows an after-tax NPV of $104 million with an IRR of 32% and a 1.9-year payback, at a 5% discount. That’s based on US$1,250/oz gold and a 76-cent Canadian dollar. Average life-of-mine head grades are 7.53 g/t Au and 21.86 g/t Ag. By comparison, the average gold grade of producing mines, globally, is about 1 g/t Au. Red Mountain is located in a beautiful corner of the world populated by snowy mountain peaks, glaciers and scenic vistas. We hiked to the top of a ridge as CEO McLeod gave us a tour that was equal parts geology and history. The bird’s-eye view included Bromley Humps, the area that will host the mill and the tailings area (we later visited by helicopter). IDM Mining CEO Rob McLeod points toward the mill/tailings facility location in the Bitter Creek Valley. The Golden Triangle’s history of high-grade gold mining points to its potential. Pretium’s Brucejack is just the latest in a region with a long list of past producing high-grade mines, including Snip, Eskay Creek, Premier and Granduc. And IDM’s development is part of a Golden Triangle revival that is driving some incredible share price gains among area drill plays. The most notable is GT Gold Corp., whose shares started 2017 at 25 cents and have rocketed above $2.50 on drill results. The stellar initial intercepts included 6.95 metres grading 51.53 g/t gold and 117.38 g/t silver. The stock surge has vaulted GT Gold to a market capitalization of almost $200 million. That compares to about $50 million for IDM, whose Red Mountain is an FS-stage advanced development project with a defined deposit and lots of upside. 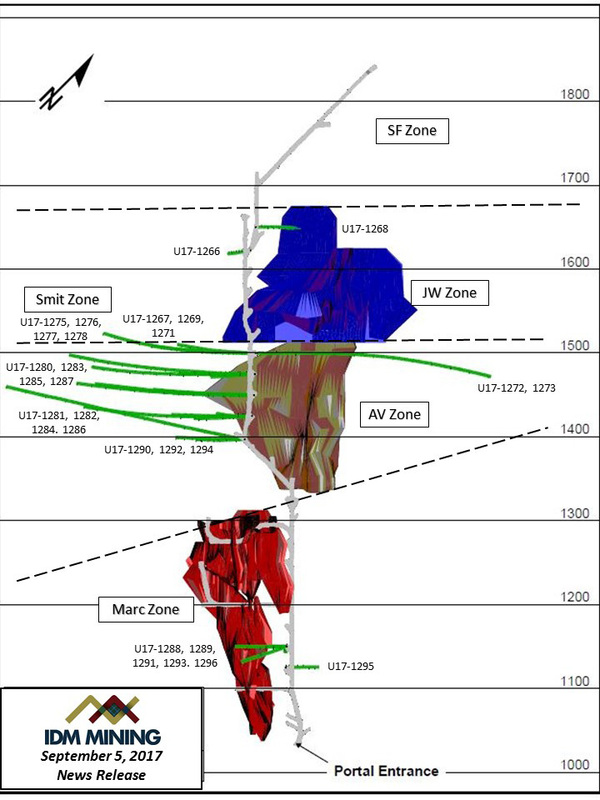 8.6 metres of 12.33 g/t Au & 70.9 g/t Ag (U17-1245, JW Zone step-out). Other high-grade Canadian gold plays are being picked off by majors, one by one. Recent projects that have been purchased include Lake Shore Gold ($945 million by Tahoe), Kaminak ($520 million by Goldcorp) and Integra ($590 million by Eldorado). The latest to be snapped up was Richmont Mines, a high-grade underground producer recently acquired by Alamos Gold for $933 million. 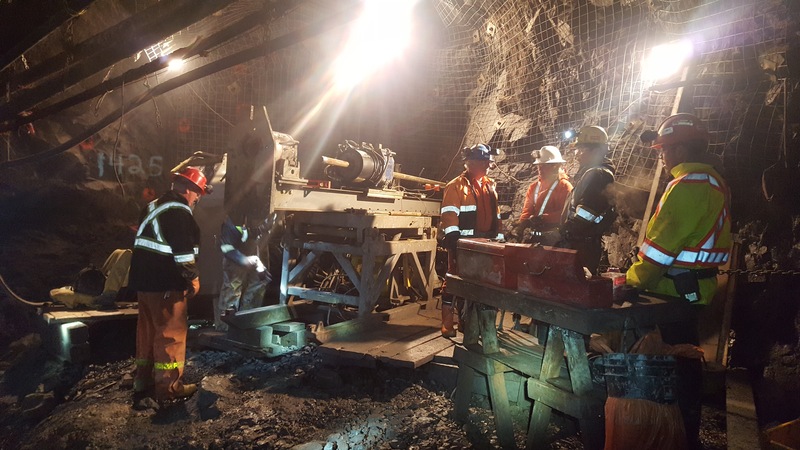 Richmont produces gold at two underground mines in Ontario and Quebec. The global gold mining industry is facing a supply crunch. Demand remains strong, driven primarily by the Asian appetite, ETF inflows and central bank buying. But on the supply side, gold mining companies are struggling to keep pace. It’s primarily due to a lack of new discoveries, a trend that is forcing miners to process lower-grade ore as they deplete existing ore bodies. The average grade at producing gold mines, globally, is about 1 g/t Au. It’s a worrying industry trend since grade remains king, as well as being a key determinant of the profitability of gold mining companies. That puts a target on IDM Mining’s Red Mountain, which has gold grades multiples of the global average. Cash costs net of silver credits for the Red Mountain project would be US$492/oz, according to IDM’s recent Feasibility Study. Smart management teams purchase unloved, unwanted assets for pennies on the dollar during bear markets, then turn them into viable economic projects in time for the commodity upcycle. That’s the playbook for IDM and the timing looks good, especially with gold’s push above $1,300/oz. IDM leveraged millions of dollars of prior development, including almost 2,000 metres of underground tunnels. The infrastructure advantage extends to road access from Stewart, as well as plentiful and cheap power. British Columbia has some of the least-expensive industrial power rates of any jurisdiction in the world. Stewart is Rob McLeod’s hometown and he has deep family roots there, which makes construction of a mine at Red Mountain personal. The town of Stewart used to be a thriving mining hub but is heavily exposed to the cyclicality of the sector. For example, Stewart’s 1910 population of 10,000 dropped as low as 17 people less than a decade later, during the First World War years. Rob’s father Ian McLeod and his uncle Don (after whom IDM is named) prospected mountains in the region for gold – including the property that now hosts Pretium’s high-grade Brucejack mine. Stewart boomed again with the opening of the Premier mine, which operated from the 1920s to 1952 and was North America’s largest gold mine. How deep are the CEO’s ties to Stewart? Rob’s father was born in Stewart in 1927 and served as mayor for 15 years. He also owned the King Edward Hotel in Stewart from 1952 to 2001. IDM’s Executive Chairman is Mike McPhie, a mining veteran who was CEO of Curis Resources (bought by Taseko Mines) and a director of Silver Quest Resources (bought by New Gold). Another third-generation miner, engineer Ryan Weymark, joined IDM Mining in the spring. His father and grandfather were also mining engineers and spent their careers at Teck Cominco. 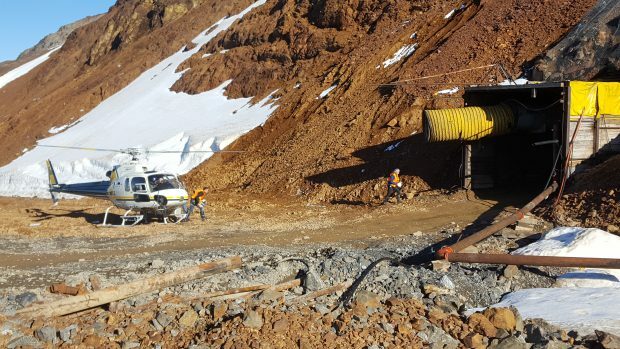 IDM’s high-grade stepout hits at Red Mountain mean the 5.4-year mine life outlined by the Feasibility Study is likely to be extended, perhaps considerably. Infrastructure costs for a mine would be fixed, so finding additional ounces is highly accretive to mine economics. And the upside goes beyond defining additional ounces at Red Mountain. Glacial melt has uncovered areas of mineralization that have never been drilled or explored, such as Lost Valley. A resource update is expected in the first quarter of 2018. 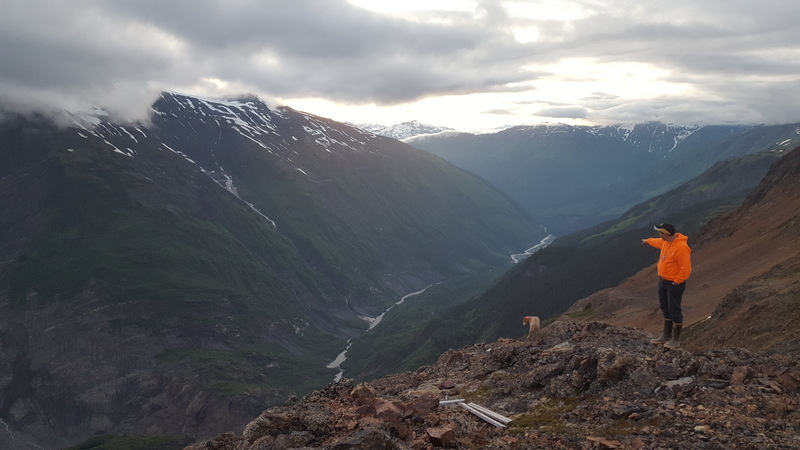 A deal IDM announced in late 2016 has given the company a call option on a promising portfolio in the Yukon, one of the world’s hottest exploration jurisdictions. The company sold its Yukon projects (formerly owned by Ryan Gold) to Strikepoint Gold (SKP-V) for $4 million, most of it in StrikePoint shares. As a result IDM holds 18% of StrikePoint’s outstanding shares, joining other major shareholder Eric Sprott, who owns a 12% stake. 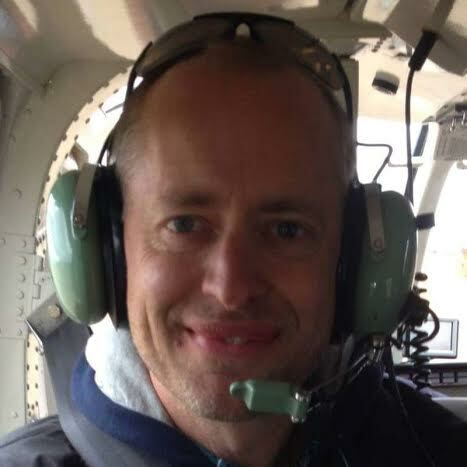 StrikePoint’s VP Exploration is Yukon veteran Andy Randall, who was chief geologist for Ryan Gold when that Shawn Ryan vehicle spent $25 million to advance the Yukon projects. StrikePoint is spending $2.5 million this year to explore three properties: Mahtin, Pluto and Golden-Oly. The fledgling company, helmed by Shawn Khunkhun, has about $8 million in the treasury and is fully funded through 2018. IDM’s stake is worth about $2.9 million at StrikePoint’s current share price. Disclosure: IDM Mining is a Resource Opportunities sponsor and the author is long IDM Mining shares, which makes him biased. This article is for informational purposes only. All investors are responsible for their own trades and need to do their own research and due diligence.